In 9330 BCE Enkiite Prince Horus (Marduk’s grandson), shot down and wounded his uncle Seth, then crushed Seth’s testicles so Seth couldn’t reproduce a rival. Horus then ruled Egypt and the Anunnaki Council exiled Seth to Canaan. In Canaan, Seth ruled the Hybrids descended from Noah’s son Ham joined Marduk in his push from Egypt to take the Sinai Spaceport and Mission Control Center in Jerusalem from Enlil’s lineage (the Enlilites). Inanna’s twin, UTU, held off the Seth’s Ham-ite forces and the Igigi Astronauts in Sinai. Ninurta, in a new jet with a 75-foot wingspan, blasted Marduk’s strongholds in Africa. NINURTA shot poison missiles on the Africans. He led the Enlilite forces agains the African heartland of Enki’s son NERGAL and Nergal’s temple-city Meslam. Ninurta “scorched the earth and made the rivers run red with the blood of the innocent bystanders, the men women and children of the Abzu [Africa].” He rained poison-bearing missiles on Meslam and leveled the city. Survivors fled to nearby mountains. But Ninurta “with the Weapon that Smites threw fire upon them, smote down the people. Adad roamed behind the enemy lines” and wasted the fish, cattle and food of the Enkiites and their armies. Marduk’s Earthlings retreated into the mountains but INANNA blasted them with “an explosive beam that tore them apart” and forced them south. Ninurta defeated Marduk’s army in Kur. Marduk fled into the Great Pyramid at Giza, where Enki “raised up a shield through which the death rays could not penetrate.” The Enkiites-Marduk’s father ENKI, Marduk’s brothers NINAGAL and GIBIL and Marduk’s grandson HORUS joined Marduk in the pyramid. Marduk’s brother NERGAL “broke through Ninurta’s lines and came to Marduk’s aid. Nergal strengthened the pyramid’s defenses through ray-emitting crystals [computerized devices] positioned within.” The Enkiites made their stand together in the Giza Pyramid but Marduk’s brother NINGISHZIDDA refused to join and defend him in the pyramid. Then Horus, disguised as a ram, slipped out of the pyramid but Ninurta blinded him with his “Brilliant Weapon.” Enki radioed Ninmah to stop the fight and save Horus. Enki hesitated, “Out shall we come if to a peace treaty between our lineages Enlil commits.” But he gave her his hand. Ninmah led him and his lineage loyalists to the Harsag. “Ninurta entered the pyramid and explored the Enkiites’ astronavigational guidance systems and secret weapons. He found all the MEs, the technology and Hermetic science, operating the Bond-Heaven-Earth, a computer loaded with astronomical data and a program to scan the sky and the actual state of the solar system (the tablet of destinies Anzu stole in Nippur), the technology of a control tower for interplanetary travels to scan and calculate the trajectories, as well as the means to communicate with Anu and Nibiru.” Ninurta smashed the Destiny Stone [an electronic device] that held calculus and astronomy programs as well as “the power to track individuals with a killing ray.” He blew up the Heart of the Ekur—the pyramid’s emitting source, where HCL and hydrated potassium amplified the microwave from the pumped pool beneath the pyramid. He salvaged the interplanetary landing beacon and the Gug Stone atop the pyramid, “that directions determined.” Ninurta broke or looted 54 large crystals that spiraled energy up, around out the top of the pyramid to rockets and to Nibiru. Ninmah “brought out Enki and his sons, took them to her abode in the Harsag. The Enlilite gods were there, waiting. ‘Find peace. We, descendants of Anu all, must of warring cease,’” Ninmah urged. Enlil gave Enki a peace-offering: Eridu (Basara), a large area with fruit trees and seeded fields. Ninurta objected; Eridu would give the Enkiites a foothold in Sumer. But Ninmah told Ninurta–her son–to drop the issue and he obeyed. Enlil agreed to stop Enlilite attacks if the Enkiites and the Earthlings descended from Shem left Canaan’s Restricted Zone (the Sinai Peninsula and Spaceport) and Jerusalem. Enki demanded his Enkiites keep Giza. To this, Enlil agreed if “the sons of Enki who brought about the war and used the Great Pyramid for combat be barred from ruling over Giza or Lower [Northern] Egypt.” So Enki replaced Marduk as Egypt’s ruler with Ningishzidda, Enki’s son with Enlil’s granddaughter Ereshkigal. Ningishzidda had refused to fight for Marduk and Enki against Ereshkigal’s paternal uncle, Ninurta. The Enlilites could accept Ningishzidda, though an Enkiite, to rule Egypt, since his mother, Ereshkigal, was an Enlilite. Both lineages accepted Ningishzidda as Nile Delta ruler. Enlil ordered all astronavigational communications and guidance equipment stay in lands he and his Enlilites ruled. Astronauts who’d sided with Marduk must leave the Landing Place in Lebanon as well as Canaan. Treaty concluded, Enki and sons left for Africa. “We must wake up, become conscious and do things better. We suffer our karma. Yet, we are growing up, becoming wise, and as long as I breathe, I dedicate my life, my very existence to my People, and, to you dearest, dear Sister.” So concluded Enki’s communication,” Ninmah said. 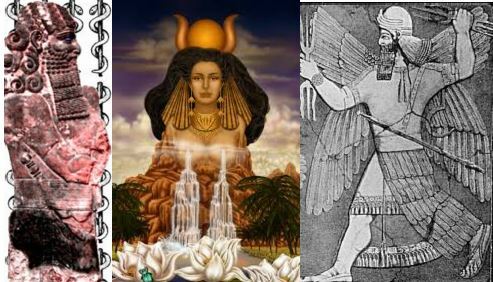 * The Bible has conflated and altered Sumerian Names, Ninmah, Enki, Enlil, Marduk, Nannar, Adamu, Adapa into other, composite characters–Lilith, Adonai, Yahweh, Satan, Allah, etc.